Alfred Angelo Sapphire Wedding Dresses, 2016. Satin Fit and Flare Gown with Cut-Away Back: Chic fit and flare satin gown with a dramatic beaded waistband and T-strap style halter neckline embellished with rhinestones. 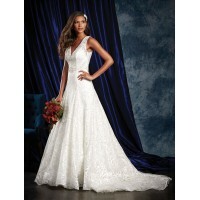 The gown features a dramatic cut-away back neckline and a full godet flared skirt. Covered buttons and a chapel length train finish the gown. Color: 143 - Light ChampagneAlfred Angelo Sapphire Wedding Dresses, 2016. Satin Fit and Flare G..
Color: 602 - Ivory/Silver Alfred Angelo Sapphire Wedding Dresses, 2016. All Over Beaded Organz..
Color: 1 - White Alfred Angelo Sapphire Wedding Dresses, 2016. Floral Embroidered Lace Ball Go..
Color: 181 Alfred Angelo Sapphire Wedding Dresses, 2016. Floral Embroidered Lace Ball Gown wit..
Color: 602 - Ivory/SilverAlfred Angelo Sapphire Wedding Dresses, 2016. A-Line Net Over Organza Gown ..